Hearing- the solid thud-type impact the clubface makes with the golf ball. Feeling- little to no vibration after impact. The golfer again feels a solid impact, where all of the energy is converted into the trajectory of the ball. Sight- a photo-finish posture the golfer holds, as the ball tracks down the fairway or onto the green. The left thumb represents the golf club shaft and the swing plane. The base of the left thumb assists in setting the Protract element. The right thumb represents the clubface at impact. This is important to the golfer, because the swing should start back from impact position to the top of the takeaway swing. The left thumb and the nodule just above the left thenar are the lead components for presetting the wristbands. Please refer to the two photographs. 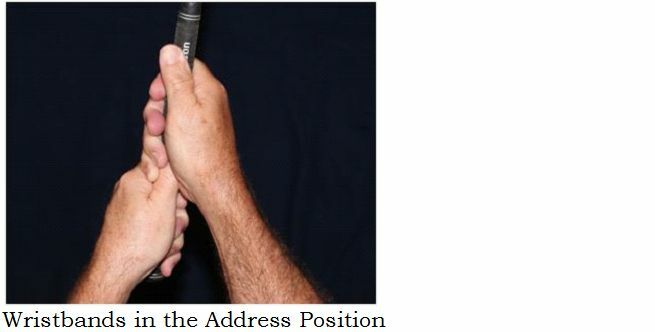 Here the wrists are at address and in the pre-set position, called the Lock position.